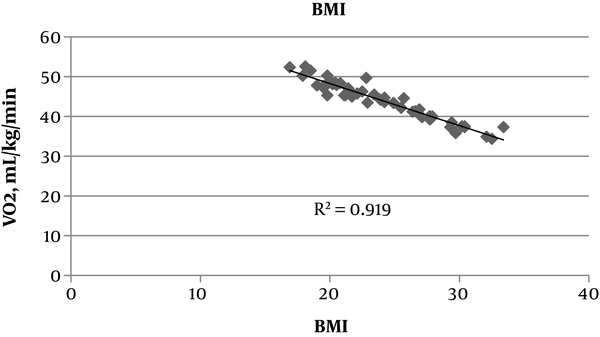 To Cite: Afshari D, Rami M , Shirali G A, Azadi N. Evaluation of the Effect of Body Mass Index and Body Fat Percentage on the Maximal Oxygen Consumption: A Cross-Sectional Study, Jundishapur J Health Sci. 2019 ; 11(2):e87283. doi: 10.5812/jjhs.87283. Background: In order to assess the cardiorespiratory condition of people and as a result to create a physiological symmetry between work and worker, physical work capacity is of high importance and can play a special role in choosing qualified workforce. Objectives: The current study aims to evaluate work capacity and examine the effect of body mass index (BMI) and body fat percentage (BFP) on aerobic capacity. Methods: In this cross-sectional study, 50 male university students voluntarily participated. Work capacity was measured with the use of a treadmill and the Bruce protocol. BMI and BFP, as the variables of the research, were measured using the device while the subjects were undergoing the test. The relationship between the variables was investigated using the Pearson correlation test. Results: The mean and standard deviation of age for the people under the study was obtained as 21.36 ± 2.08 years. The mean and standard deviation of the aerobic capacity was estimated at 44.01 ± 4.75 (mL/kg/min). The results showed that there was a significant inverse relationship between BMI, BFP, and Maximal oxygen consumption (VO2max). The level of significant was set as 0.05 (P ≤ 0.05). Conclusions: The findings indicated that BMI and BFP, as the variables, were effective factors in the people's aerobic capacity. These indices can be used as a criterion for determining the aerobic capacity of people. One of the most important applications of ergonomic science is adapt the work type with human capabilities and limitations (1). Hence, to measure physical activity, capacity is one of the important topics of ergonomic science, which has been emphasized by the International Labor Organization (2). One of the effective measures in this regard is to measure the physical work capacity (3). The physical work capacity (PWC) is the maximum level of energy, which an individual can use in an 8-hour period in kcal/min without experiencing any physiological stress and physical fatigue (4). Nowadays, scientists state that the maximal oxygen consumption (VO2max) should be used to determine the physical work capacity (2). The maximal aerobic capacity reflects the maximal oxygen transfer rate of the muscles, which is acceptable in many cases to measure the fitness between the individual and the considered work (5). Maximal oxygen consumption is considered as a first-class standard to measure the practical limit of the cardiorespiratory system (6, 7). The main unit for maximal aerobic capacity measurement is expressed in l/min or mL/min. However, as the absolute value of this variable is strongly affected by body weight, it is often expressed with unit of mL/kg/min (8). Various factors affect the maximal aerobic capacity, including environmental, psychological, physical, and physiological characteristics of individuals (9). With increasing the aerobic power, that is, oxygen uptake capacity, the physical power will be higher. It means that an individual can perform heavy activities better and more easily. Thus, aerobic power is an appropriate criterion to express the physical ability of individuals to perform work or an individual fitness with the work (10). Physical fitness includes five elements of aerobic capacity, muscle strength, muscle endurance, flexibility, and body composition (11). Research has indicated that the physical composition of individuals as another physical factor is closely associated with aerobic fitness. The studies conducted in this regard indicate that the maximal aerobic capacity is associated with body composition factors such as body fat percentage, body mass index, and body muscle mass (12, 13). Researchers have also presented valid estimates of aerobic fitness using the variables of age, gender, body fat percentage, and body mass index (BMI) (14, 15). Results of previous studies suggest that low physical activity results in a low level of physical fitness and, as a result, high body fat percentage (16). The maximal aerobic capacity will be measured based on the precision required and the existing level of risk by using various methods, including direct and indirect methods (17). In the indirect method, laboratory tests based on heartbeat response are used (18). Direct measurement of VO2max requires specialized equipment and considerable physical effort and motivation. Moreover, when high precision is required, direct tests are used to determine the maximal oxygen consumption (17). Cycle ergonomic, conveyor belt, and stair test are the tools used to measure the maximal aerobic capacity of individuals (19). In addition, Treadmill Bruce test is used as a standard method to measure the aerobic capacity and cardiovascular fitness of athletes or healthy non-athlete individuals (20). Very limited studies have been conducted so far in Iran to evaluate the effect and the relationship between body fat percentage and body mass index on work capacity of individuals. Most of the studies conducted in this regard used indirect methods, which have lower precision in the estimation of physical activity capacity. Hence, the present research was carried out to estimate the capacity of physical activity and evaluate the correlation between body fat percentage and body mass index using direct reading methods. Given the high accuracy and precision of the measured parameters, the present research can be used as appropriate in the assessment perform activity capacity. This is a cross-sectional study conducted on 50 male volunteer students of Ahvaz University of Medical Sciences with an age range of 20 - 30 years to examine the factors affecting the work capacity of the subjects. Necessary explanations were provided on the method of implementing the work and the consent of participants was taken to complete the form of demographic information questionnaire. After completing the questionnaire the subjects were prepared to perform the work capacity test by considering the inclusion criteria, including lack of history of cardiovascular, respiratory, musculoskeletal disease, and lack of history of drug use. Participants with history of exercise were excluded from the study. The test to determine the physical work capacity was performed using the Bruce protocol on h/p/cosmos company treadmill (Saturn model, Germany), gas analyzer (ergospirometry) (Gunshorn model, Germany). Bruce Treadmill test includes seven 3-minute steps (21). The form and speed of the treadmill are automatically changed owing to an increase in slope at each step (20). In the first step, an individual starts walking at a speed of 2.7 km/h and a slope of 10%. In the second step, the speed increases to 4 km/h and the slope increases to 12%. The speed and slope, respectively, increased to 5.5 km/h and 14%, 6.8 km/h and 16%, 8 km/h and 18%, 8.9 km/h and 20%, and 9 km/h and 22% in the following steps (20, 21). The body fat percentage and body mass index were measured, while the participants had on light clothing, by using a machine method. The height of the subjects was measured, without any shoes on, by using a tape meter with a precision of 0.1 cm. Moreover, the components of the body composition of the subjects including weight, body mass index, and body fat percentage were measured by using the direct reading method and Body Composition Device (Olympia3.3 model, Korea) during performing the Treadmill Bruce. The data were analyzed using the SPSS 21 software after performing the necessary measurements. In this study the variables were continuous and the distribution of data was normal (one-sample Kolmogorov-Smirnov test), hence the Pearson correlation coefficient was used to test the hypothesis to determine the relation between BMI, BFP, and VO2max of the research participants. A total of 50 Ahvaz University of Medical Sciences students, with the age range of 20 - 30 years, participated voluntarily in this research. The mean age of the participants was 21.36 ± 2.08 years. The mean and standard deviation of the height of the subjects were also 176.16 ± 6.02 cm. The mean of maximal aerobic capacity of the subjects in this research was estimated 44.01 ± 4.75 (mL/kg/min) using a Bruce Treadmill test. Table 1 illustrates the mean and standard deviation of the components of the body composition studied. Table 2 illustrates the correlation between body fat percentage, body mass index, and physical work capacity of the subjects. The results suggest a significant and reverse correlation between the variables of body composition and VO2max the physical work capacity of the subjects (P ≤ 0.05). In addition, the results of simple linear regression analysis suggest a significant and linear relationship between BMI and VO2max (R2 = 0.919, P ≤ 0.001). This correlation suggests that the physical work capacity of individuals decreases with increasing the body mass index (Figure 1). In addition, with regard to the relationship between two variables of body fat percentage and VO2max, simple linear regression analysis results show a significant and negative linear relationship between these two variables (P ≤ 0.001, R2 = 0.756). 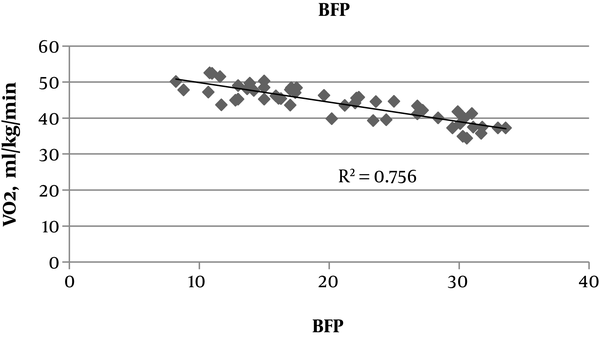 This relationship indicates reduction in the work capacity of individuals as a result of an increase in BFP (Figure 2). The objective of this research was to evaluate the relationship between body fat percentage, body mass index, and physical work capacity. In this research, the mean age of participants was 21.36 ± 2.08 years. According to the results of this research, there was no significant relationship between mean VO2max and age. This result was consistent with that of studies conducted by Mombeini et al. (9) and Habibi et al. (22). However, it was inconsistent with result of the study conducted by Chatterjee et al. (23) and Daneshmandi et al. (24). In justifying lack of a significant relationship between age and work capacity, we can refer to the limited age range and the younger age of all participants of the research. The mean and standard deviation of VO2max in the subjects was estimated as 44.01 ± 4.75 in terms of mL/kg/min. This value was close to the results of the research conducted by Mondal and Mishra (17) in males (43.25 ± 7.25 mL/kg/min) and Sterkowicz et al. (41.9 ± 4.62 mL/kg/min) (25). In addition, the results of this research were high than those reported in the research conducted by Hosseinabadi et al. (36.9 ± 3.72 mL/kg/min), Daneshmandi et al. (35.95 ± 7.39 mL/kg/min) and Rafieepour et al. (32.60 ± 10.39 mL/kg/min) (10, 24, 26). The mean age of the participants was 40 years in the research conducted by Hosseinabadi et al. (10) and 32.01 years in the research conducted by Daneshmandi et al. (24). As the participants in the research are at a young age, with the mean age being 21.36 years, the inconsistency can be attributed to the difference in work capacity in different age groups and the limited age range of the subjects (young students). In addition, in the research conducted by Rafieepour, 58.1% of the participants were female (26). As this research was conducted on males, and gender is a factor affecting the physical work capacity, the difference in results might be due to the effect of gender on the individuals' work capacity. In this research, the mean BMI and BFP was determined (24.03 ± 4.31) kg/m2 and (20.77 ± 7.6)%, respectively. Based on the World Health Organization (WHO), the BMI of the subjects was within the normal range of (18.5 - 25) kg/m2 (19). In this regard, the relationship between body mass index and maximal work capacity in this study showed a significant relationship between these variables. These results showed that the value of VO2max, in terms of mL/kg/min, decreased with an increase in BMI. It is in line with result of previous studies (27-29). The results of studies conducted by Mondal and Mishra (17), Sterkowicz et al. (25), Hsieh et al. (30), and Laxmi et al. (31) were consistent with the results of this research. With regard to the reverse relationship between body mass index and VO2max, several studies have referred to the effect of weight and body composition on VO2max, which might be due to the physiological effects of weight gain. Weight gain and BMI increases the body’s need for blood supply to the tissues, and owing to limited heart's capacity, blood is not supplied well to tissues, therefore, the oxygen available to the tissues is reduced (32). In this research, the mean and standard deviation of the BFP in the studied students were estimated to be 20.77 ± 7.6%, which was within the normal range (16% - 24%) (17). According to the results of this research, a significant and negative relationship was found between work capacity of individuals and body fat percentage (% PBF), which is consistent with the results of research conducted by Amani et al. (20), Minasian et al. (33), and Ostojic et al. (34). In addition, in a research conducted by Shete et al. (8) and Pribis et al. (35), there was a negative relationship between VO2max and BFP. Increased fat around the heart, which occurs usually due to obesity, can reduce the heart pumping. Thus, it might finally reduce the heart capacity and the ability of performing the daily tasks (20, 32). The results of this research showed a significant and negative correlation between body mass index and body fat percentage as well as capacity for performing the physical works. These results showed that BMI and BFP variables are among the factors affecting the capacity of individuals to perform their physical works. This study is one of the first studies conducted to estimate the association between body fat percentage, body mass index, and VO2max using direct reading method. The results of this research showed that the limitations of previous studies, which used the indirect methods with lower precision to estimate the capacity performing physical works, can be resolved by estimating these variables using direct reading methods. Some of the limitations of this research included the cross-sectional nature of the research and the lack of observing the effect of different factors over time, the limited population, and the lack of evaluating the effect of gender on work capacity. Hence, it is recommended that similar studies be conducted with larger sample size and on workers. One of the important factors in job ergonomics is determining the capacity of performing the physical work. The results of this research suggest the effect of body fat percentage and body mass index on the capacity of performing the works; which might be effective in selecting the appropriate people based on type of activity and the capability of people finding various jobs. As the measurement of these variables using indirect methods has a lower precision, it is recommended that direct reading methods be used to estimate the work capacity and the correlation between these variables and the capacity of performing the work. The authors of this research appreciate the Sports Physiology Department of Shahid Chamran University of Ahvaz as well as its participants for their cooperation in this research. Authors' Contribution: Davood Afshari: Developing the study concept, design, and methods. Narges Azadi and Davood Afshari: Writing the primary draft of the manuscript. Davood Afshari, Mohammad Rami, Narges Azadi, and Gholam Abbas Shirali: Contributing to the development of the study protocol, data analysis, and manuscript drafting. All authors contributed to the revision of the manuscript and read and approved the final version. Ethical Considerations: The authors received an ethical approval code (ir.ajums.rec.1397.279) from Ahvaz Jundishapur University of Medical Sciences. Necessary explanations were provided on the method of implementing the work and the consent of participants was taken to complete the form of demographic information questionnaire. Funding/Support: There was no funding or support for this study. It was done as a Master of Science project. 1. Heydari P, Jafarvand M, Alizadeh SS, Varmazyar S, Hakimi C. [Predicting maximum oxygen consumption based on anthropometric dimensions in medical emergency students]. Iran Occup Health J. 2018;14(6). Persian. 2. Habibi E, Khalili GH, Karimi A, Mobasheri DM, Babaei PA, Moghiseh M, et al. [Factors affecting the maximum aerobic capacity of mine workers in Isfahan, Iran]. Health Sys Res. 2016;13(2). Persian. 3. Heydari P, Mohammadzadeh E, Varmazyar S, Beigzadeh F. [Correlation of treadmill and step tests in estimation of maximum in estimating the maximum aerobic capacity (VO2max)]. Iran Occup Health. 2016;13(2):1-9. Persian. 4. Heydari P, Varmazyar S, Nikpey A, Variani AS, Jafarvand M. Step test: A method for evaluating maximum oxygen consumption to determine the ability kind of work among students of medical emergencies. Electron Physician. 2017;9(3):4020-6. doi: 10.19082/4020. [PubMed: 28461880]. [PubMed Central: PMC5407238]. 5. Siconolfi SF, Garber CE, Lasater TM, Carleton RA. A simple, valid step test for estimating maximal oxygen uptake in epidemiologic studies. Am J Epidemiol. 1985;121(3):382-90. doi: 10.1093/oxfordjournals.aje.a114010. [PubMed: 4014128]. 6. Huggett DL, Connelly DM, Overend TJ. Maximal aerobic capacity testing of older adults: A critical review. J Gerontol A Biol Sci Med Sci. 2005;60(1):57-66. doi: 10.1093/gerona/60.1.57. [PubMed: 15741284]. 7. Astorino TA, Willey J, Kinnahan J, Larsson SM, Welch H, Dalleck LC. Elucidating determinants of the plateau in oxygen consumption at VO2max. Br J Sports Med. 2005;39(9):655-60. discussion 660. doi: 10.1136/bjsm.2004.016550. [PubMed: 16118305]. [PubMed Central: PMC1725313]. 8. Shete AN, Bute SS, Deshmukh PR. A study of VO2max and body fat percentage in female athletes. J Clin Diagn Res. 2014;8(12):BC01-3. doi: 10.7860/JCDR/2014/10896.5329. [PubMed: 25653935]. [PubMed Central: PMC4316241]. 9. Mombeini M, Habibi E, Yadegarfar G, Ordudari Z, Noorouzi H, Koolivand Z. Association of maximum aerobic capacity with general health, occupational fatigue, and job satisfaction among female employees in Isfahan hospitals, Iran. J Occupa Hygiene Eng Volume. 2018;5(1):61-9. doi: 10.21859/johe-5.1.61. 10. Hosseinabadi S, Hamidi BP, Ebrahimi H, Barkhordari A, Raie BT. Estimation of aerobic capacity (VO2max) and physical work capacity in laborers. Knowl Health. 2013;8(3):131-7. 11. Nabi T, Rafiq N, Qayoom O. Assessment of cardiovascular fitness [VO2max] among medical students by Queens College step test. Int J Biomed Adv Res. 2015;6(5):418-21. doi: 10.7439/ijbar. 12. Hill AM, Buckley JD, Murphy KJ, Howe PR. Combining fish-oil supplements with regular aerobic exercise improves body composition and cardiovascular disease risk factors. Am J Clin Nutr. 2007;85(5):1267-74. doi: 10.1093/ajcn/85.5.1267. [PubMed: 17490962]. 13. Tomassoni TL, Blanchard MS, Goldfarb AH. Effects of a rebound exercise training program on aerobic capacity and body composition. Phys Sportsmed. 1985;13(11):110-5. doi: 10.1080/00913847.1985.11708928. [PubMed: 27410016]. 14. Cao ZB, Miyatake N, Higuchi M, Ishikawa-Takata K, Miyachi M, Tabata I. Prediction of VO2max with daily step counts for Japanese adult women. Eur J Appl Physiol. 2009;105(2):289-96. doi: 10.1007/s00421-008-0902-8. [PubMed: 18985375]. 15. Sanada K, Midorikawa T, Yasuda T, Kearns CF, Abe T. Development of nonexercise prediction models of maximal oxygen uptake in healthy Japanese young men. Eur J Appl Physiol. 2007;99(2):143-8. doi: 10.1007/s00421-006-0325-3. [PubMed: 17115179]. 16. Matłosz P, Michałowska J, Sarnik G, Herbert J, Przednowek K, Grzywacz R, et al. Analysis of the correlation between body composition, construction and aerobic capacity in teenage team sport training. Eur J Clin Exp Med T.16, z. 2. 2018. doi: 10.15584/ejcem.2018.2.5. 17. Mondal H, Mishra SP. Effect of bmi, body fat percentage and fat free mass on maximal oxygen consumption in healthy young adults. J Clin Diagn Res. 2017;11(6):CC17-20. doi: 10.7860/JCDR/2017/25465.10039. [PubMed: 28764152]. [PubMed Central: PMC5535345]. 18. Rao AV, Phadke AV, Patil PB, Joshi AR. Comparison of non-exercise test and step test in estimation of aerobic capacity (VO2max) in young adults. National J Phy Pharm Pharmacol. 2014;4(3):218. doi: 10.5455/njppp.2014.4.150420141. 19. Afshari D, Angali KA, Ahangar AS, Pour SM, Amirmoezi S. [Effects of anthropometric and demographic factors on physical work capacity of students of Ahvaz University of Medical Sciences]. J Occup Hygiene Eng Volume. 2018;4(4):12-9. Persian. doi: 10.21859/johe.4.4.12. 20. Amani AR, Somchit MN, Konting MMB, Kok LY, Darestani SA, Ismail MY, et al. Relationship between body fat percent and maximal oxygen uptake among young adults. J Am Sci. 2010;6(4):1-4. 21. Stevens J, Cai J, Evenson KR, Thomas R. Fitness and fatness as predictors of mortality from all causes and from cardiovascular disease in men and women in the lipid research clinics study. Am J Epidemiol. 2002;156(9):832-41. doi: 10.1093/aje/kwf114. [PubMed: 12397001]. 22. Habibi E, Dehghan H, Zeinodini M, Yousefi H, Hasanzadeh A. A study on work ability index and physical work capacity on the base of fax equation VO(2)max in male nursing hospital staff in Isfahan, Iran. Int J Prev Med. 2012;3(11):776-82. [PubMed: 23189229]. [PubMed Central: PMC3506089]. 23. Chatterjee S, Mitra SK, Samanta A. Aerobic capacity of the brick-field workers in eastern India. Ind Health. 1994;32(2):79-84. doi: 10.2486/indhealth.32.79. [PubMed: 7806448]. 24. Daneshmandi H, Fard AR, Choobineh A. Estimation of aerobic capacity and determination of its associated factors among male workers of industrial sector of Iran. Int J Occup Saf Ergon. 2013;19(4):667-73. doi: 10.1080/10803548.2013.11077014. [PubMed: 24321645]. 25. Sterkowicz S, Lech G, Pałka T, Tyka A, Sterkowicz-Przybycień KL, Szyguła Z, et al. Body build and body composition vs. Physical capacity in young judo contestants compared to untrained subjects. Biol Sport. 2011;28(4). 26. Rafieepour A, Farasati F, Kalantari S, Motamedzadeh M, Rafieepour E. Estimation of maximum aerobic capacity and the effect. Qom Univ Med Sci J. 2014;8(3). 27. Ozcelik O, Aslan M, Ayar A, Kelestimur H. Effects of body mass index on maximal work production capacity and aerobic fitness during incremental exercise. Physiol Res. 2004;53(2):165-70. [PubMed: 15046552]. 28. Welch BE, Riendeau RP, Crisp CE, Isenstein RS. Relationship of maximal oxygen consumption to various components of body composition. J Appl Physiol. 1958;12(3):395-8. doi: 10.1152/jappl.1958.12.3.395. [PubMed: 13525300]. 29. Grassi GP, Turci M, Sforza C. Aerobic fitness and somatic growth in adolescents: A cross sectional investigation in a high school context. J Sports Med Phys Fitness. 2006;46(3):412-8. [PubMed: 16998445]. 30. Hsieh PL, Chen ML, Huang CM, Chen WC, Li CH, Chang LC. Physical activity, body mass index, and cardiorespiratory fitness among school children in Taiwan: A cross-sectional study. Int J Environ Res Public Health. 2014;11(7):7275-85. doi: 10.3390/ijerph110707275. [PubMed: 25032742]. [PubMed Central: PMC4113875]. 31. Laxmi CC, Udaya IB, Vinutha Shankar S. Effect of body mass index on cardiorespiratory fitness in young healthy males. Int J Sci Res Publ. 2014;4(2):25. 32. Farhadi S, Hesam G, Moradpour Z, Abazari M, Babayi MY. [Estimating the maximum aerobic capacity of fire fighters using the step test, a case study with height adjustable steps]. J Ergonomics. 2016;4(2):60-6. Persian. doi: 10.21859/joe-0402438. 33. Minasian V, Marandi SM, Kelishadi R, Abolhassani H. Correlation between aerobic fitness and body composition in middle school students. Int J Prev Med. 2014;5(Suppl 2):S102-7. [PubMed: 26157558]. [PubMed Central: PMC4476005]. 34. Ostojic SM, Stojanovic MD, Stojanovic V, Maric J, Njaradi N. Correlation between fitness and fatness in 6-14-year old Serbian school children. J Health Popul Nutr. 2011;29(1):53-60. doi: 10.3329/jhpn.v29i1.7566. [PubMed: 21528790]. [PubMed Central: PMC3075053]. 35. Pribis P, Burtnack CA, McKenzie SO, Thayer J. Trends in body fat, body mass index and physical fitness among male and female college students. Nutrients. 2010;2(10):1075-85. doi: 10.3390/nu2101075. [PubMed: 22253998]. [PubMed Central: PMC3257619].